I have a good friend and trusted colleague, Jaynie Bunnell. When we worked together we would regularly bemoan the fact that we could not find meaningful security metrics. All we had were the metrics that came straight "out of the box" from various vendor products. You know what I'm talking about. The metrics that vendors claim can be used in your "executive dashboard" but are really just a pile of technical data. Things like number of firewall blocks, number of vulnerabilities discovered, number of systems scanned, and the like. It's a problem. But, at this point in our saga, let's take a break and consider an entirely different question. 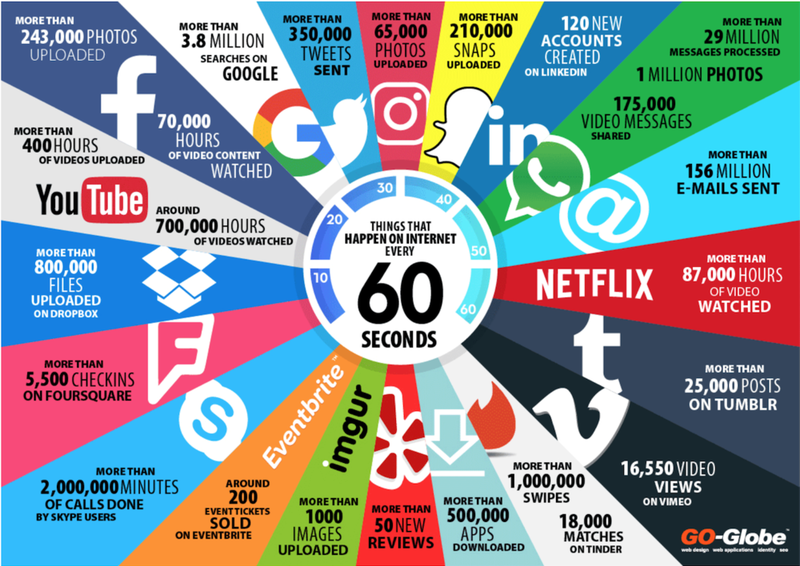 What happens in 60 seconds on the Internet. What?! Don't worry. It will become apparent momentarily why we're talking about this. Perhaps you've seen an image like the one below. The sheer volume of activity on the Internet is astonishing. I probably shouldn't be surprised though. I know for a fact that I contribute to those hours of video watched on Netflix. And I'm not ashamed to admit it! Let's go back to our security metrics problem. I'd like to think that the conversations with my good friend spurred her on to come up with this next great idea but, in reality, it was all her doing. She took the pile of technical metrics we had and turned it into the following graphic. All of our "boring" metrics are listed here. It's what happens in 24 hours in cybersecurity at our company (we really didn't do that much in just 60 seconds so we had to choose 24 hours). We didn't think much of it at the time but the image went viral within the company. About as "viral" as you can get in a large company. All of a sudden our CEO and CIO were talking about the cybersecurity team with the board and bragging to their colleagues, "Can you believe how much the security team does in just 24 hours?" It was obvious that we hit on something meaningful when we saw the marketing team had taken the same graphic and called it "What Happens in 30 Days in Marketing". Thirty days...heh. We are so busy putting out fires and deploying new capabilities that we often forget to take credit for all the great work we do. Don't bemoan what you don't have. Take that "boring" old pile of data that you already have and share it with others. It can wind up being a great marketing tool. Sign up to receive my latest updates and articles.